After celebrating my 50th birthday in La Arena and meeting our friend Frank Seier, we cycled the final bit of the Careterra Austral to Puerto Montt. 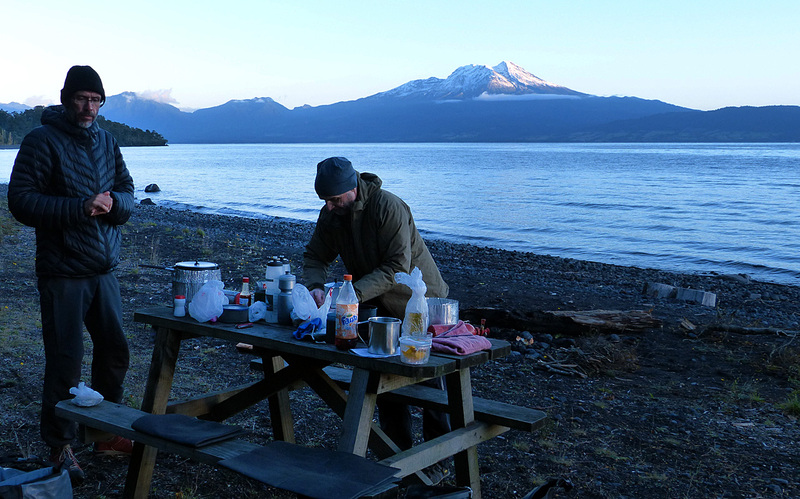 We only stopped to get groceries and carried on to Puerto Varas, about 20 km north, on Lago Llanquihue. It’s a much nicer town than the industrial port city of Pto. Montt and we really were not up to cycling into and spending time in a busy city of nearly a quarter million souls. Toasting Paul’s 50th birthday in La Arena with a box of high quality plonk. 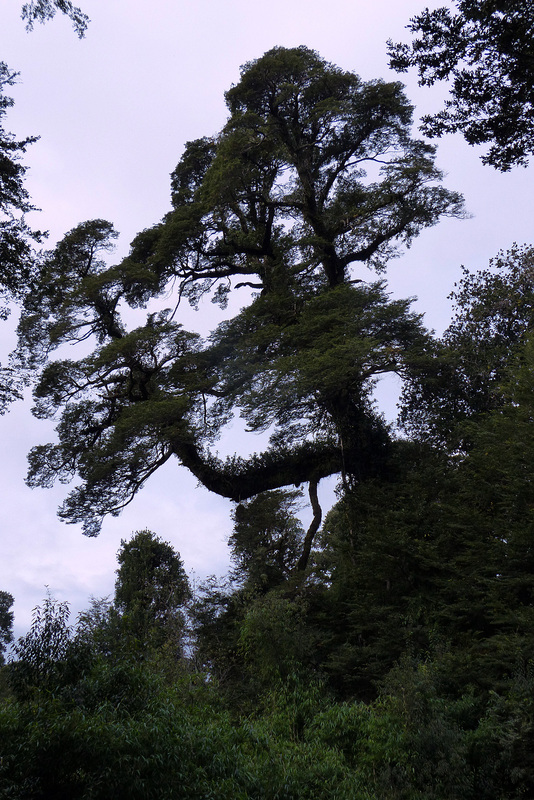 Puerto Varas is more like a resort town, and since it’s low season, it was nice and quiet. 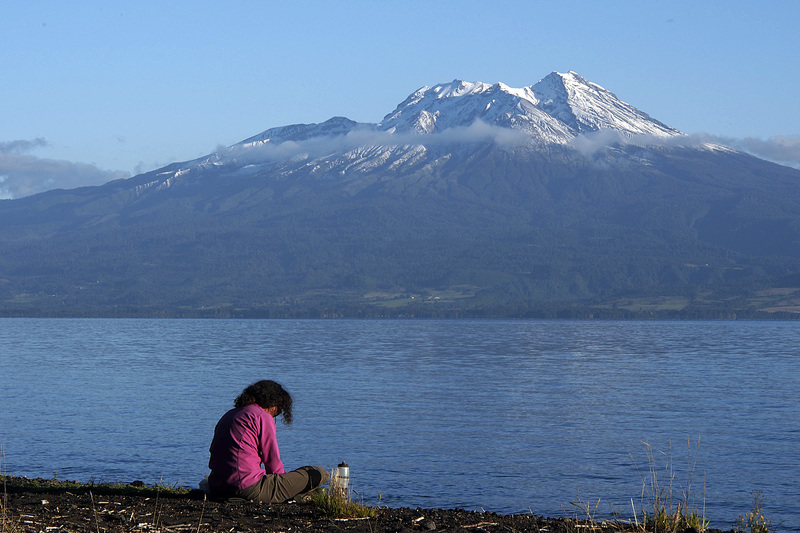 It sits in the shadows of two volcanoes: Osorno and Calbuco. Both are active volcanoes. 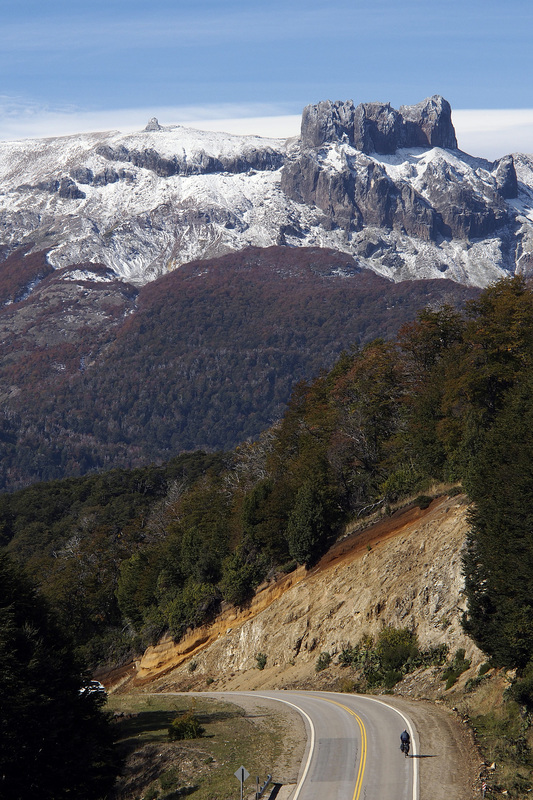 The last major eruption was from Calbuco in 1972. 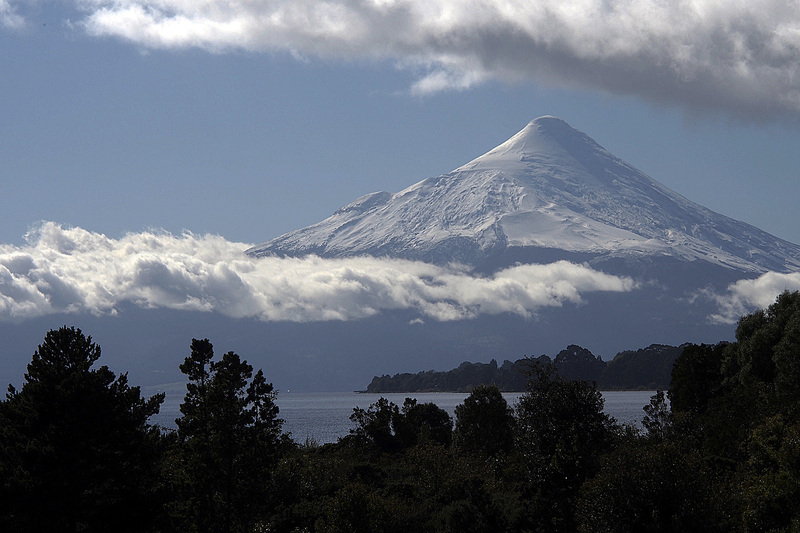 Osorno is probably one of the more famous volcanos because of it classic conical shape and glacier-covered summit, often compared to Mt. Fuji in Japan. We found a little cabaña in Puerto Varas where we made dinner, drank some beer and wine and spent the night planning our escape from Chile. 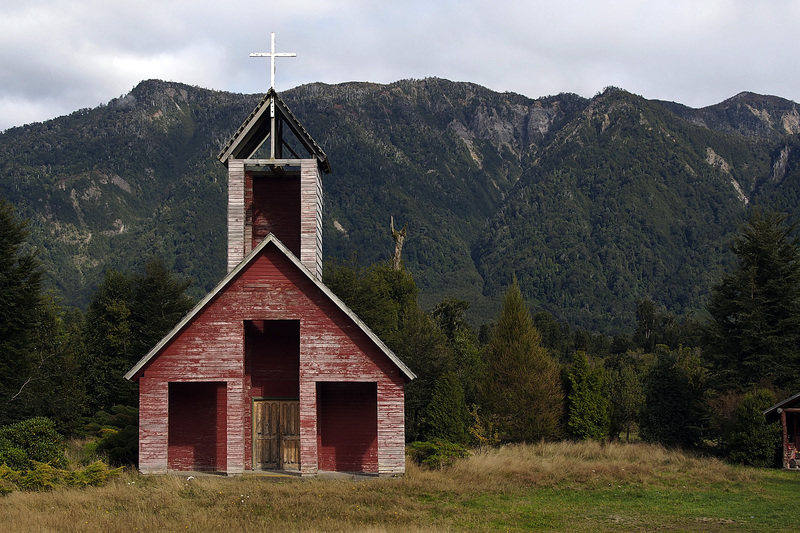 The plan was to head north along some of the lakes in this area as far as Lago Puyehue and then head east to cross the Andes via Paso Cardenal Antonio Samoré into Argentina’s Lake District. We had a little rain the day we cycled to Puerto Varas but by the afternoon it was a brilliant sunny day. This trend continued the next day as we cycled along the scenic shores of Lago Llanquihue in the shadows of the two volcanoes. 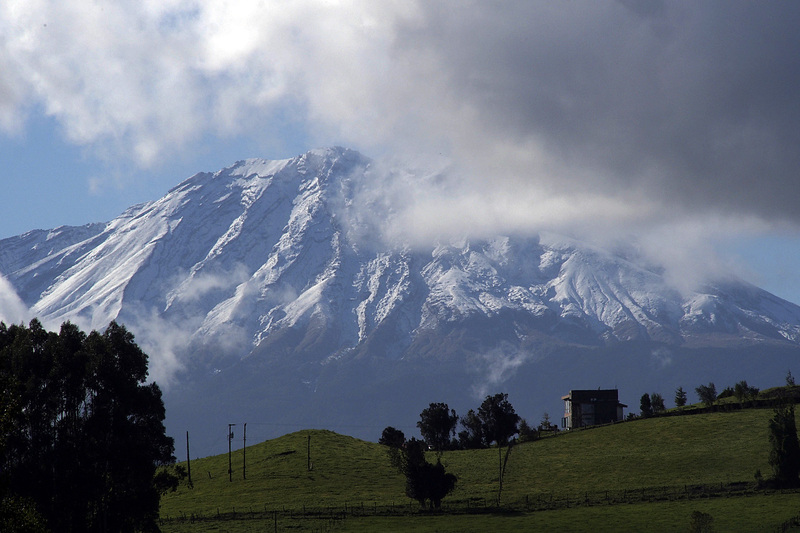 Osorno Volcano dominates the landscape at 2,652 metres. The lake sits only about 100 metres above sea level, so this imposing volcano rises dramatically on the lake’s eastern shore. 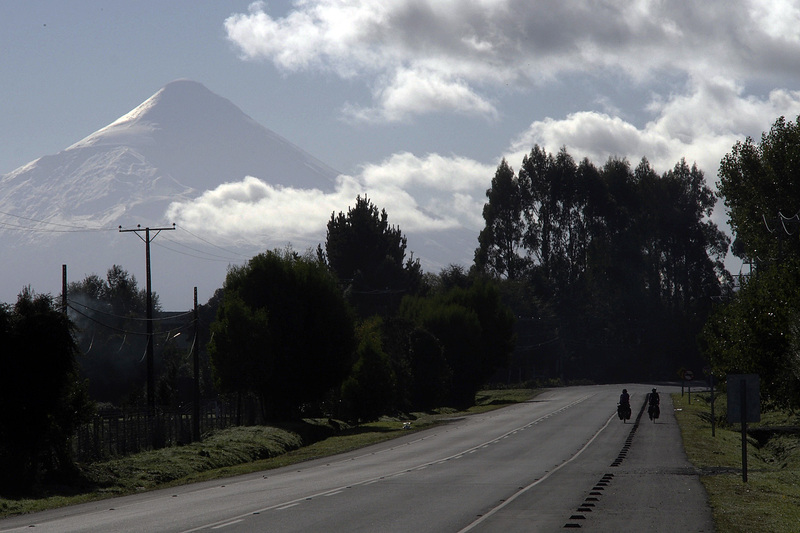 Riding north from Puerto Varas toward Osorno Volcano. Lunch along Lago Llanquihue looking at Osorno Volcano. There is a bike path along most of the shore of Lago Llanquihue and since it was the weekend, there was very little traffic so the ride was superb. We cycled only 60 km to a lovely, free beach-side campground that we had all to ourselves. We sat in the sun, drank the local hooch we had bought from a couple of ladies in a road-side stand in the small town of Ensenada, and thoroughly enjoyed the warm, tranquil afternoon. 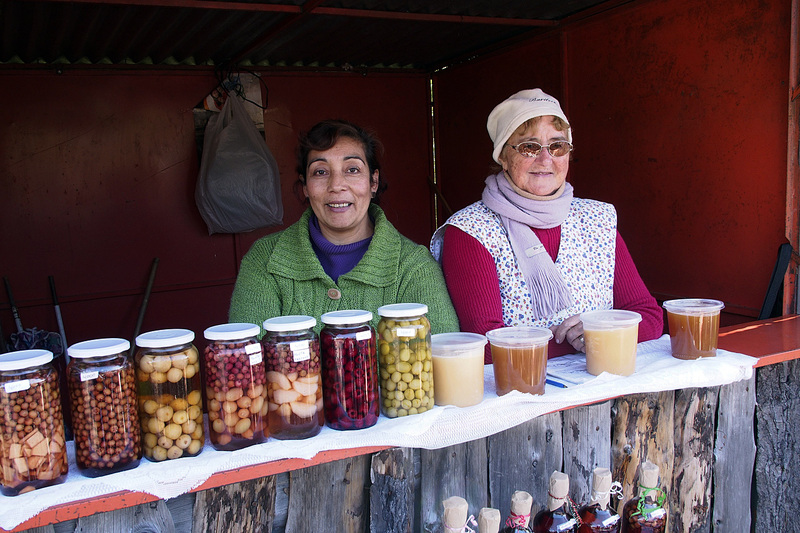 Señoras selling canned fruit, honey, jams and booze. We bought some booze. 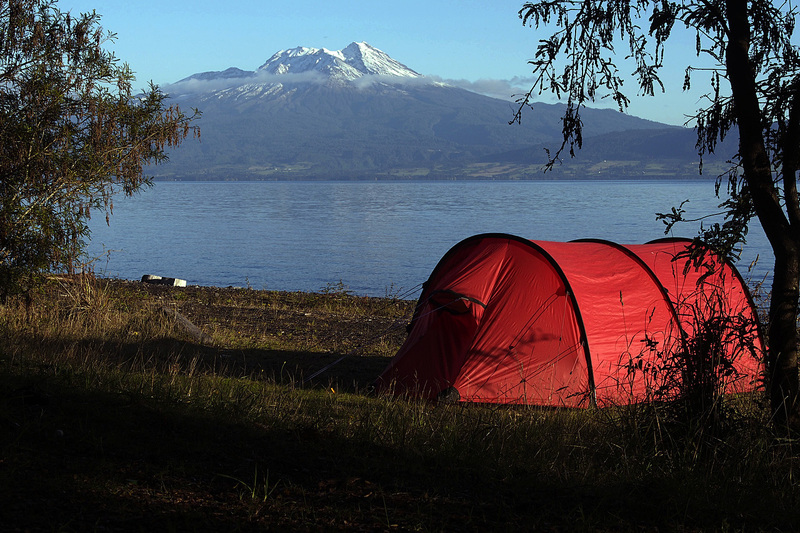 Jan at Lago Llanquihue campsite. As soon as the sun dropped, though, the temperature dropped with it but there was loads of cut firewood so we made a small fire by which to warm ourselves while we cooked and ate our dinner. 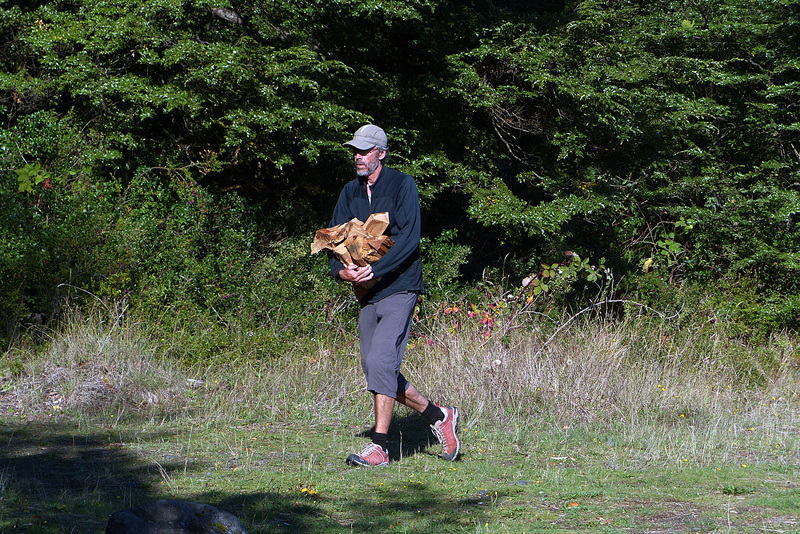 Paul hauling fire wood to camp at Lago Llanquihue. Amazingly, the weather continued in our favour despite the following day being mostly cloudy but warm, as we cycled north through the countryside along the western shore of Lago Rupanco on our way to Entre Lagos on the shores of Lago Puyehue. We missed the initial turn-off as we were drafting each other at a high speed down the smooth pavement. We ended up having to ride about 12 km on a gravel road connecting back to the road leading north to Entre Lagos. Again, we rented a little cabin which was much more pleasant than camping as the night time temperatures have been close to zero. 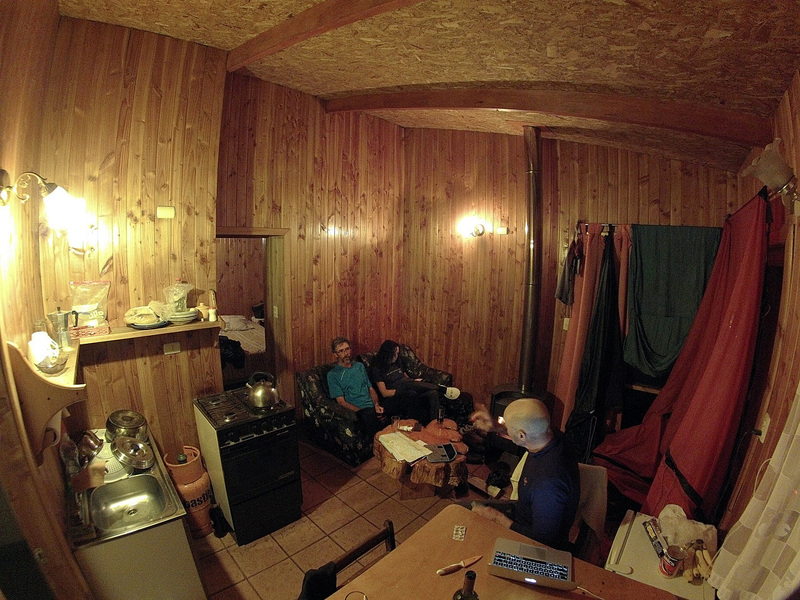 Our cabin in Entre Lagos. Looking west across the lake, Puyehue Volcano lurks on the horizon. This is another very active volcano which last erupted in June, 2011. 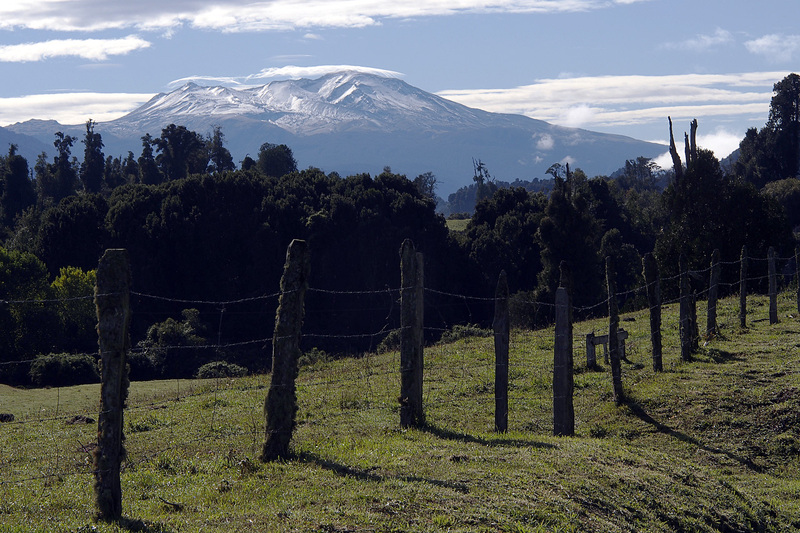 It’s actually four volcanos: Puyhue, Cordón Caulle, the Cordillera Nevada Caldera and the Pliocene Mencheca Volcano. Together they form a massive volcanic complex. In 2011, the eruption originated in the Cordón Caulle fissures sending ash across the southern hemisphere as far as Cape Town, South Africa and beyond, all the way to Australia and New Zealand. 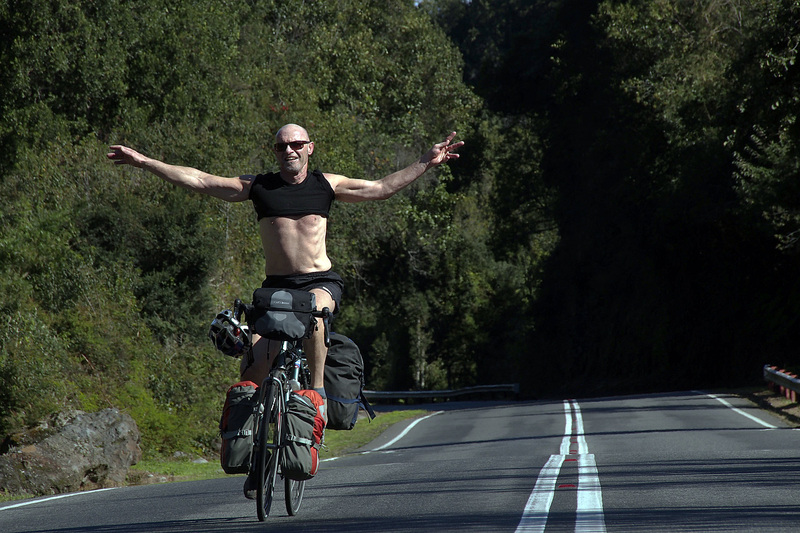 We enjoyed another brilliant, sunny day as we cycled east from Entre Lagos toward the Puyehue volcanic complex. We had hoped to spend some time in the thermals around the east end of the lake but the Puyehue Resort was asking a rather steep CHP$30,000 ($60) for the privilege of a soak and we respectfully declined, hoping to find another thermal pool a few kilometres up the road, as told us by the very friendly guard at the resort, but we never did. Frank channeling his inner Marco Pantani. 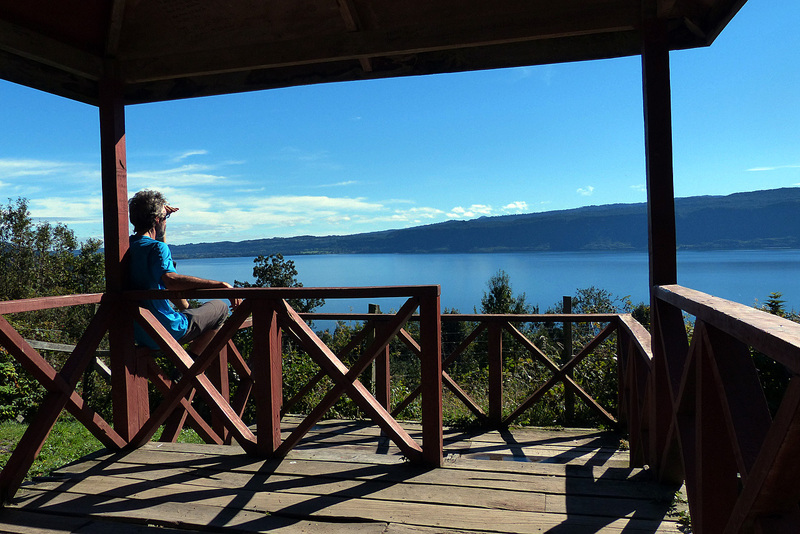 Taking a break overlooking Lago Puyehue. 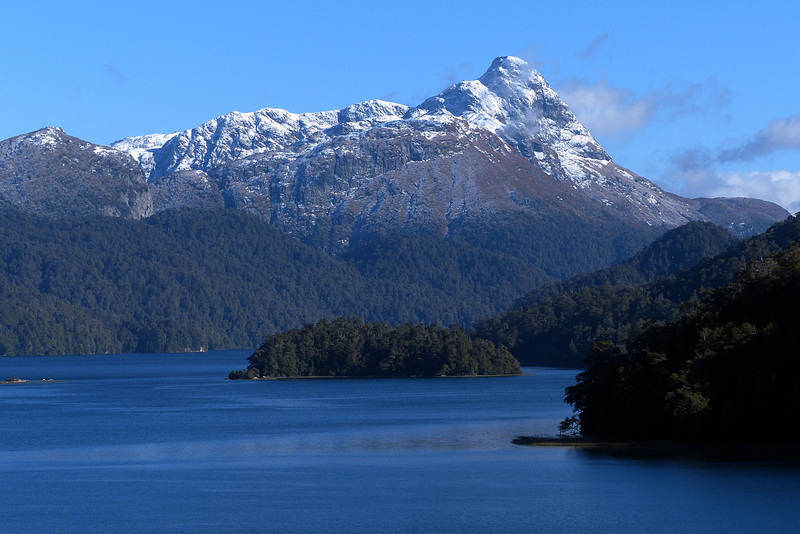 Since we did not want to camp up too high in the pass – too cold – we stopped at the offices of Puyehue National Park where there is a small lodge and campground owned by the Chilean forest service (CONAF) but operated privately. We were warmly greeted by Christian who immediately made us feel welcome. We decided to camp but to have dinner in the lodge. Wooden church near Anticura along the road up to Paso Cardenal Samoré. Since we arrived early in the afternoon, we had time for a little hike around the campsite where some trails lead off to various waterfalls and view points. Huge beech trees make up most of the forest here. They are amazing trees. 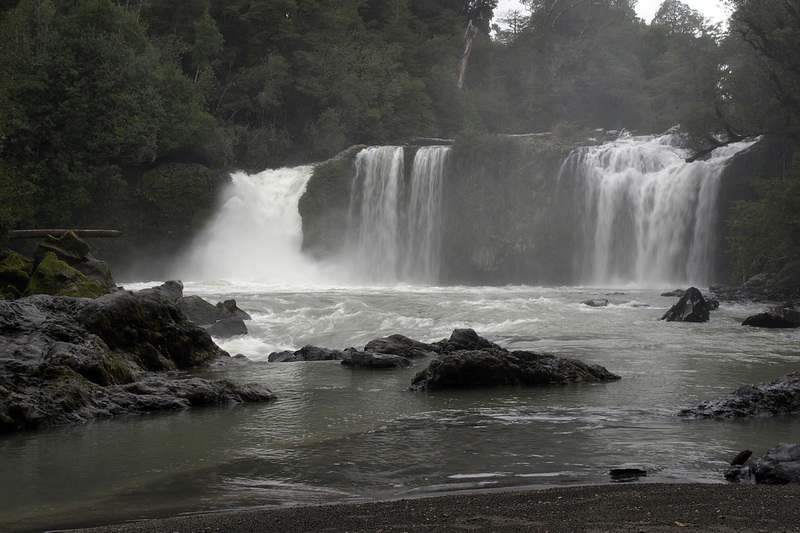 Waterfall near our Anticura campsite in Puyehue National Park. One of the magnificent old beech trees in our campsite. Inside the lodge, a huge fire place cast a warm glow all around. There were only two other guests that we saw, a couple from Argentina, Noëlle and Peter, who were turned back at the border a few minutes after closing time. So the four of us and some of the lodge staff sat by the fire as we ate and drank the night away. 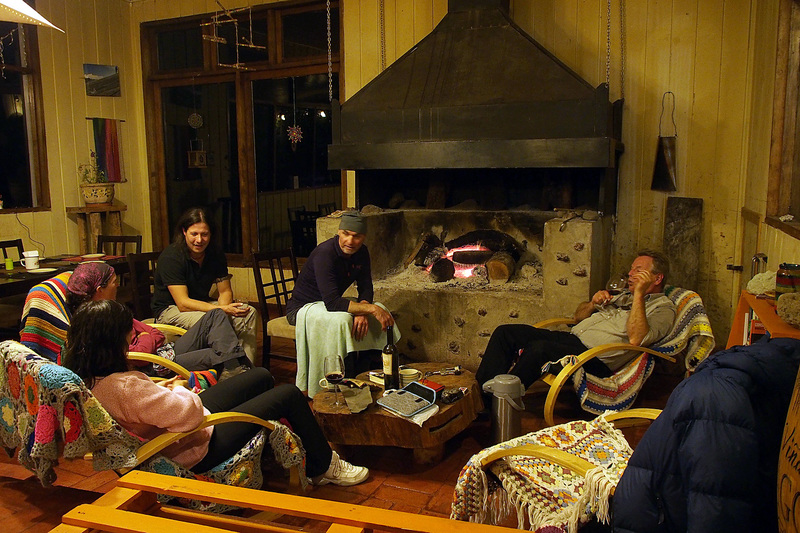 An evening in the lodge with Christian, Noel and Peter at Anticura in Puyehue National Park. We did not see any of them the next morning while we cooked our breakfast and packed up in preparation for our crossing of the Andes into Argentina. It had rained during the night but it was dry by the time we started our climb to the border. From the lodge, the road climbs for 27 km and gains almost 1,000 metres in elevation ending at Paso Cardenal Antonio Samoré at 1308 metres. It’s not a steady climb but rather two short climbs and descents sandwiching an 11-kilometre-long climb at a constant 5 % incline with some ramps up to 9 %. 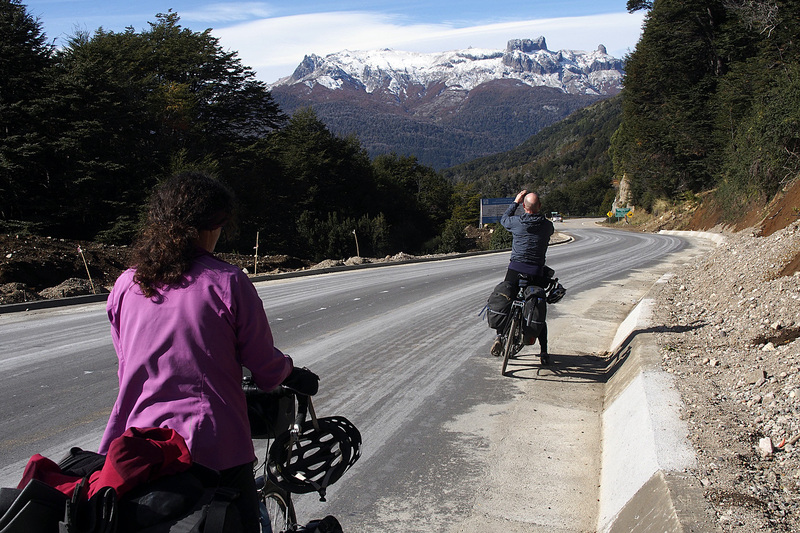 It took us two and a half hours of steady cycling to gain the pass where we stopped briefly to don all our warm clothes for the 20-kilometre descent and the Argentine border post. While it had been cloudy and foggy on the Chilean side, there was some sun on the Argentinian side as the dramatic Andean landscape continued to roll out ahead of us. 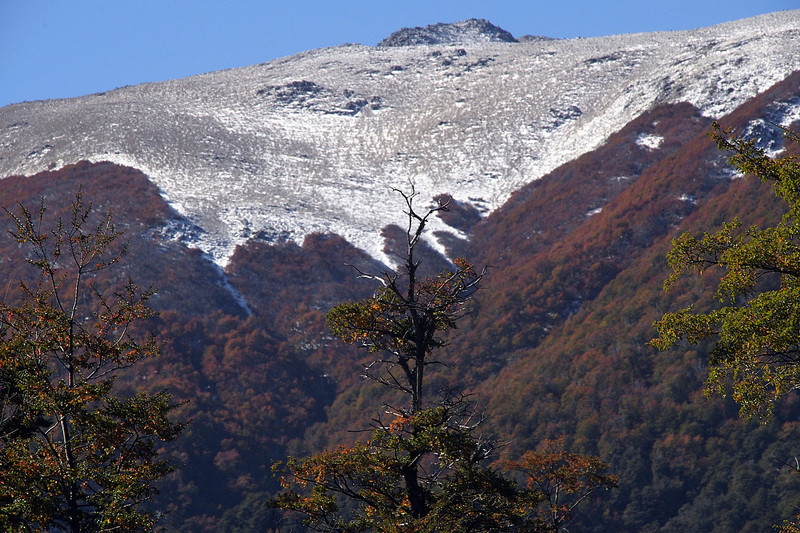 It’s nearly winter near the top of Paso Cardenal Samoré. Descending into Argentina from Paso Cardenal Samoré. Crossing the border was pretty painless. 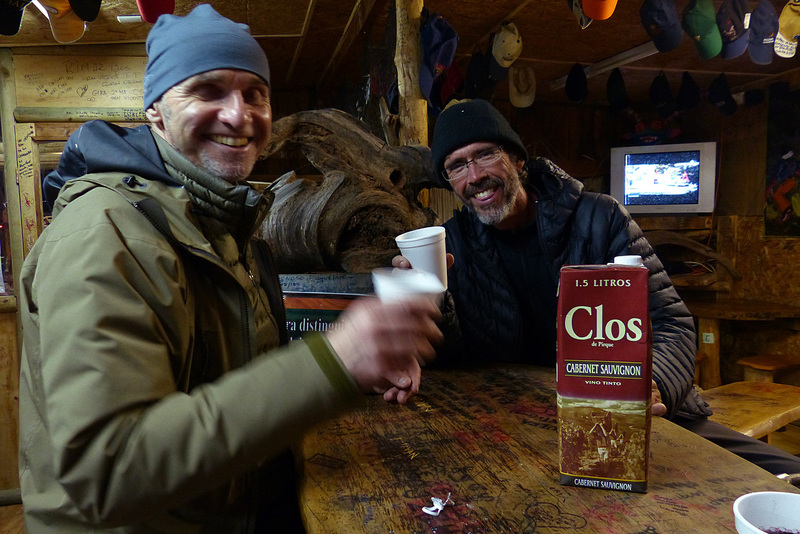 Just a formality, really, and we rode to Villa La Angostura in the hopes of finding another cabaña for the night. It was the beginning of Semana Santa, Holy Week for the Easter Holidays, and we worried we might not find any accommodation. But we were lucky and found a lovely cabin in the centre of town and promptly decided to take the next day off and spend two nights. We relaxed and wandered around Villa La Angostura, watching the bad weather move in from the warmth of our little cabaña. We also swapped the chains on our bikes, cleaning the other one and packing it up. We swap chains every 2,000 km or so to make the drive train last longer. 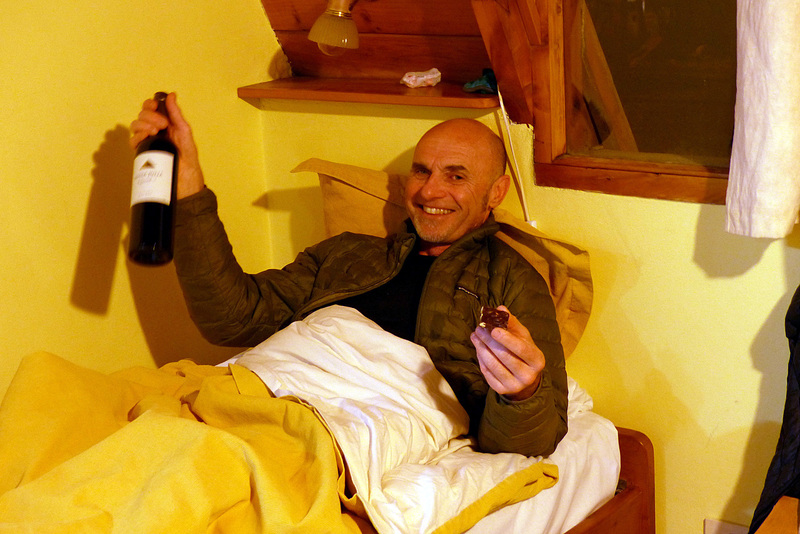 Frank with wine and chocolate in our cabaña in Villa La Angostura. Overnight, the mountains all around were covered with fresh snow contrasting with the fall colours lower down the slopes. 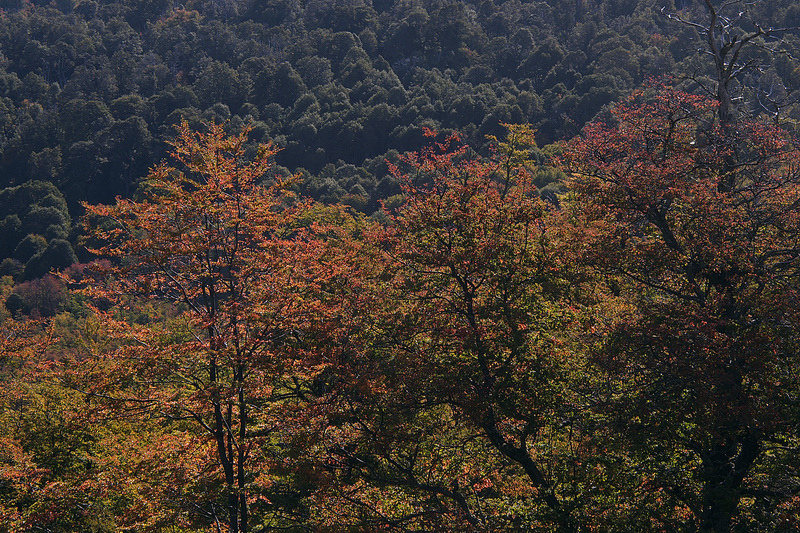 We awoke to another sunny day, perfect for our ride to San Martin De Los Andes. It was cold as we set off at about 10 but soon enough the sun rose higher in the bright blue sky and the temperature rose with it. 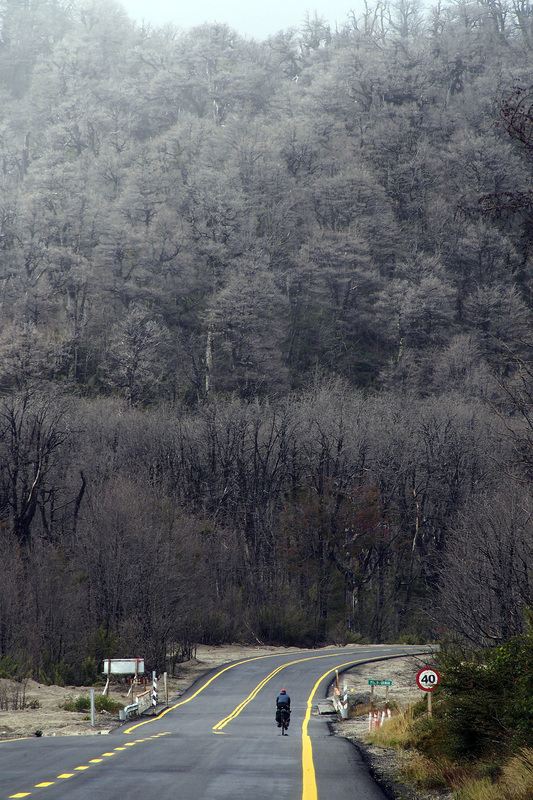 Frost greeted us in the morning ride from Villa La Angostura to San Martin De Los Andes. 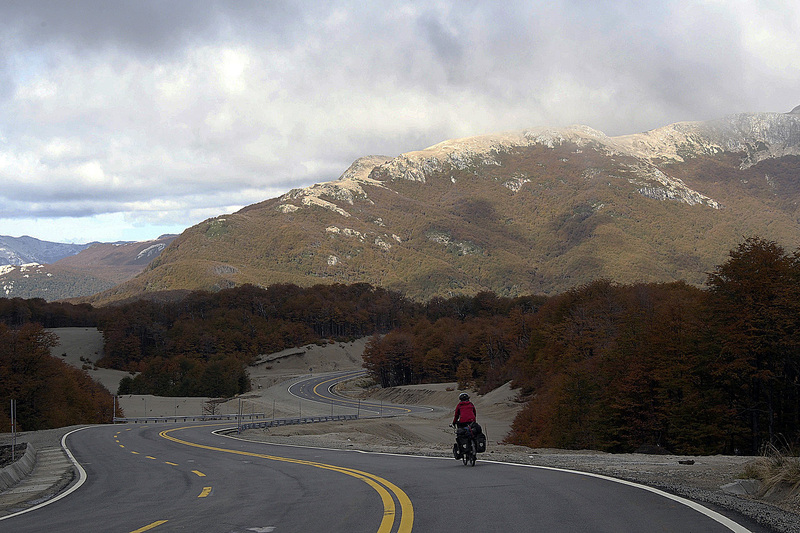 Jan along the road to San Martin De Los Andes. Lago Espejo along the 7 Lakes Route to San Martin De Los Andes. We did not think we could make it all the way to San Martin but decided to give it a go. It was a fairly long day as we rode 110 km with a total of 1700 meters of climbing but the final 18 km was a sustained downhill from 1100 metres all the way down to 600 metres above sea level into San Martin. It was a great ride down. It was one of the finest days of cycling we’ve done with gorgeous scenery and a good road, even though there was a section of gravel that was a bit slow and bumpy. 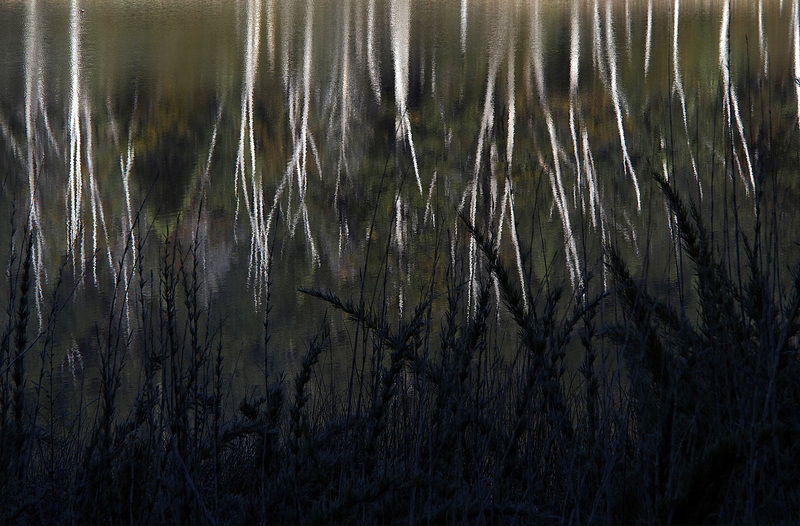 Reflections in a small lake along the road to San Martin De Los Andes, the 7 Lakes Route. Fall colours on the lower slopes and winter in the alpine along the 7 Lakes Route. Taking in the magnificent scenery along the 7 Lakes Route. This 7 Lakes Route is truly gorgeous cycling. Not much traffic and breathtaking mountain scenery, especially with the fresh snow on the summits and the fall colours on the lower slopes. I guess our timing to be here was perfect. Frank descending a slope along the 7 Lakes Route to San Martin De Los Andes. 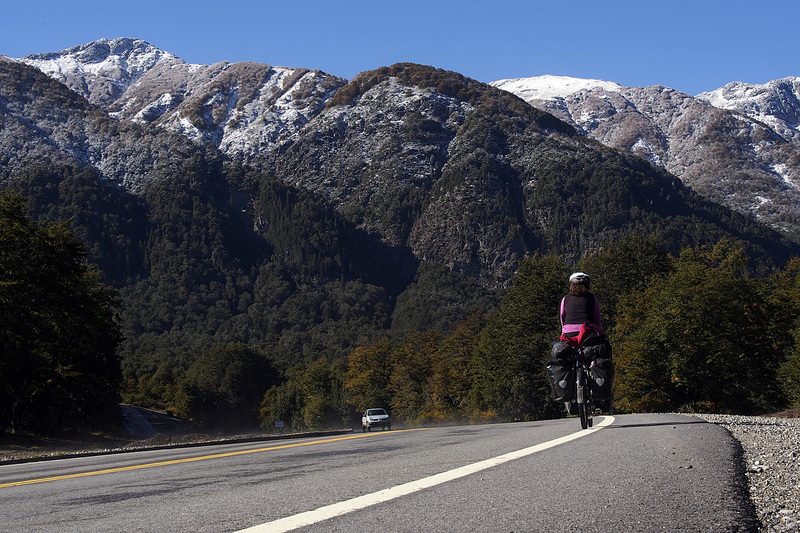 From San Martin we rode 40 km to Junin De Los Andes, the final stop on the 7 Lakes Route. Frank left us from there the next day, taking a bus back to Santiago, Chile, and home to Copenhagen, and we hopped on a bus to Mendoza to skip about 1,000 km of pampa which would have taken us two to three weeks. Instead, we booked “cama suites” on the overnight bus which was like flying first class, complete with seats that fold down into beds, meals with wine and a personal video screen with movie selections. It was a pretty nice way to travel. So, now we are in wine country and will do our utmost to sample some of what it has to offer. Here are a few more photos of our ride along the 7 Lakes Route. 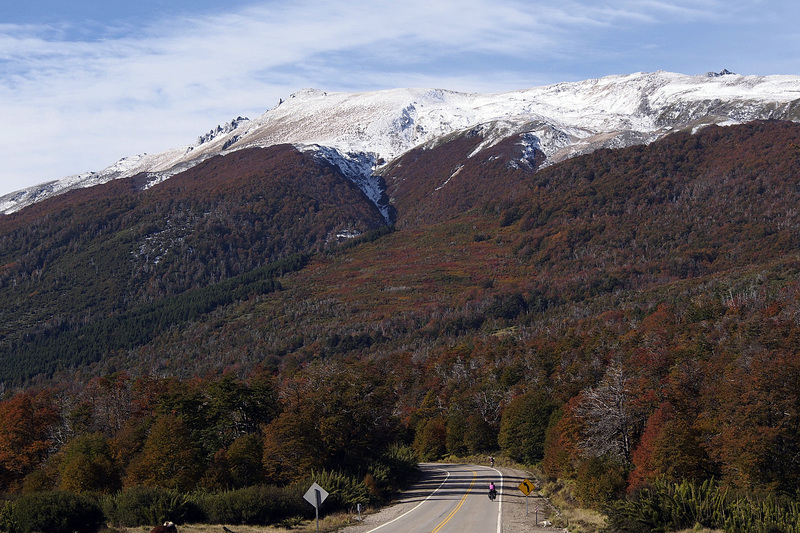 Fall and winter along the 7 Lakes Route. 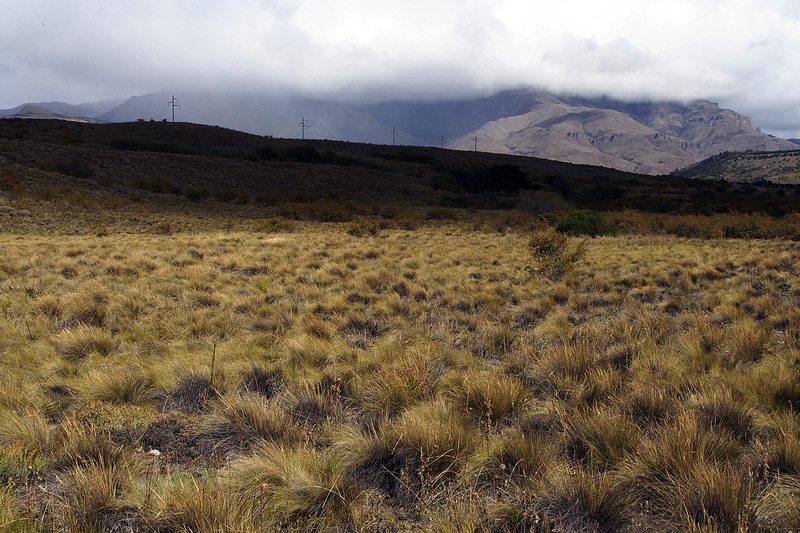 Pampa north of San Martin De Los Andes. 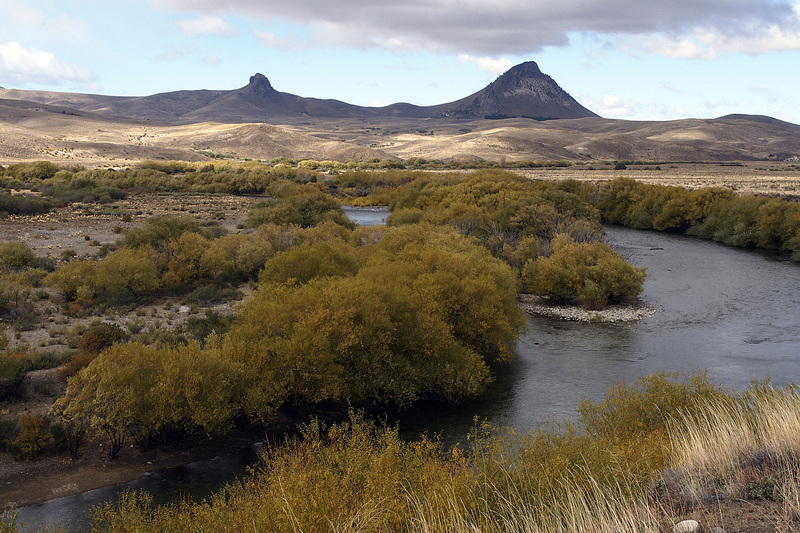 Rio Chimehuin south of Junin De Los Andes. 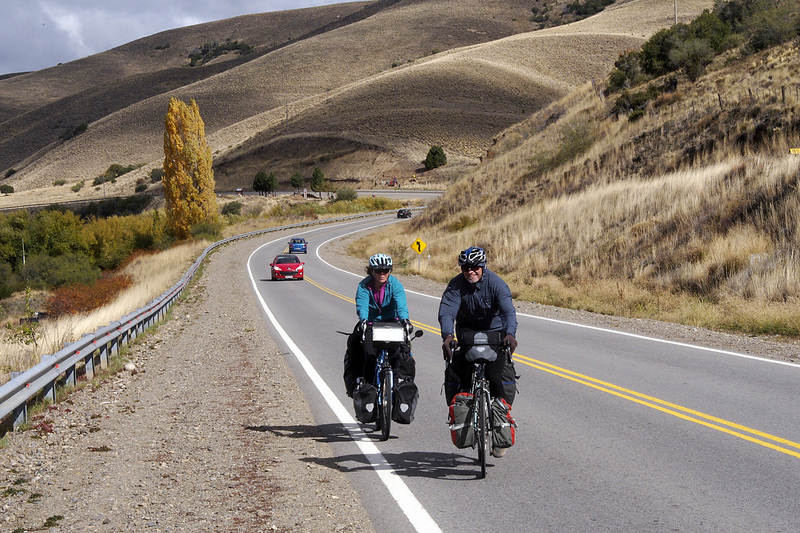 Jan and Frank riding into Junin De Los Andes. 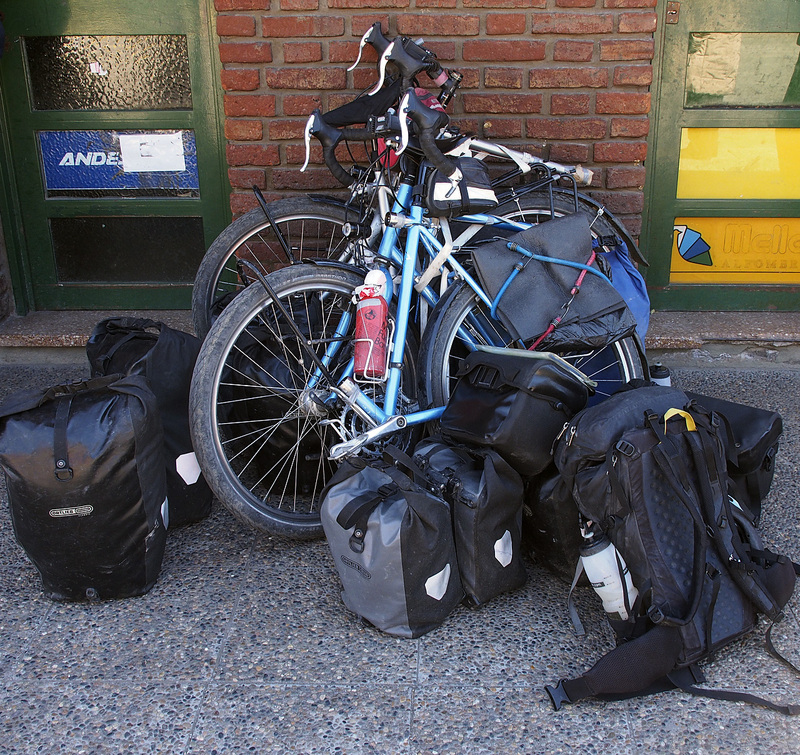 Our pile ready for the bus from Junin De Los Andes to Mendoza. Very nice report (again)! It’s a welcome and pleasant 9-2-5 break! 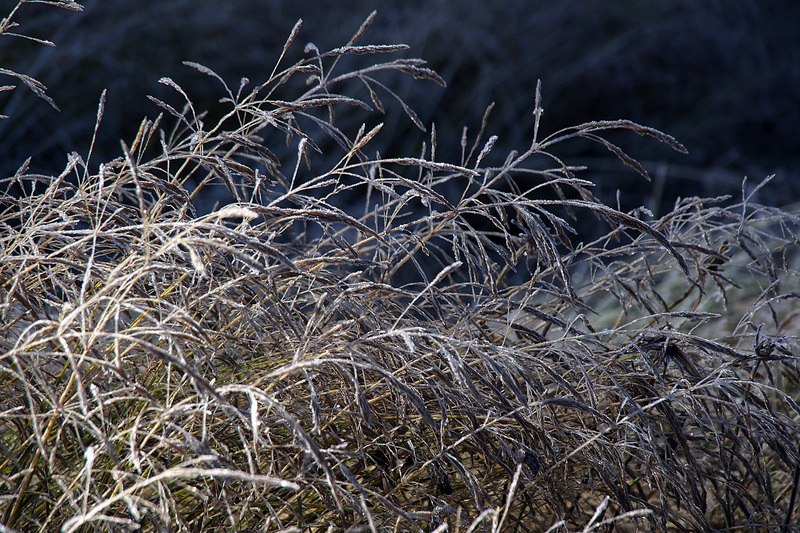 Your photographs and descriptions of the journey continue to fascinate! 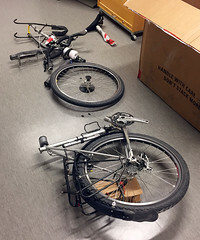 The photo of the bikes ready for the bus at the end of your last post was interesting – hard to see details but it looks like the frames come apart. What sort of bikes are you riding? The world is full of wonders and you are so fortunate to be able to explore them; such an incredible trip, keep on riding amigos. Thanks for the virtual journey! Just an amazing Journey. Keep on Enjoying and take care. Wonderfull pictures, what a ride, I’m jealous. Did you receive our birthday mail ? Ride on, we love to be able to bike with you visiually. I’ve saved all pictures from Iceland to here. As always beautiful pics. As summer comes around here I am actually missing you guys on the street scene. Great stories.